Long-term data on radial increment dynamics in Mediterranean species may identify which climatic variables are the main constraints for radial growth and at which temporal scales they act. 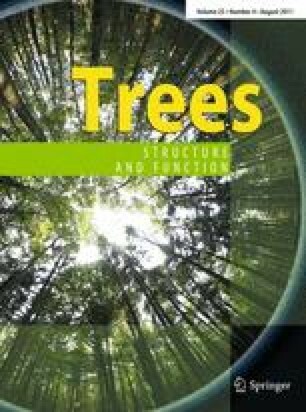 To this end, we examined stem radial fluctuations in Quercus ilex L., the dominant evergreen oak species in the Western Mediterranean Basin, over a period of 11 years (1994–2004) at a coastal site in north-eastern Spain. We used manual band dendrometers to record girth changes in trees on north- and south-facing slopes. Annual increments measured by dendrometers showed good agreement with annual tree-ring width. North-facing trees showed a lower long-term cumulative radial increment than south-facing trees. The seasonal radial increment pattern of Q. ilex was bimodal, being characterized by a greater increase in May and a lesser, more variable increase peak in September. Both phases corresponded to warm and moist climatic conditions, whereas radial increase of stems stopped in winter and occasionally in summer. Considering the whole year, mean maximum air temperature was the main factor positively affecting radial increment of Q. ilex from short- (5 days) to- long (30 days) time scales, whereas the accumulated precipitation exerted a similar effect at longer (30 days) scales, but only on south-facing trees. In summer, all trees were positively correlated with precipitation at long-time scales (30 days); however, only stem increment of south-facing trees showed a significant relation to the temperature at short-time scales (10 days). We confirmed the dominant role of temperature as the major constraint on radial increment at short time scales, despite most previous studies were mostly biased towards precipitation effects at monthly scales. This study was initiated thanks to the Spanish project (Ref. FOR91-0689) directed by Dr. Gabriel Montserrat. It was also partially funded by the EU project FORMAT (Ref. ENV4-CT97-0641). We thank the Unidad de Sanidad Forestal (Gob. Aragón) and the Parc Nat. Garraf (Dip. Barcelona) for their support. We are very grateful to A. Bernat and M. Abril (Dept. d’Ecologia, Univ. Barcelona) who helped during fieldwork. We thank Robin Rycroft for revising English, and two anonymous referees whose criticisms and comments helped us to improve the manuscript. FC was funded by FCT (Portuguese Ministry for Science and Technology) through a PhD fellowship (SFRH/BD/10677/2002). JJC acknowledges the financial and collaborative support of project CGL2008-04847-C02-01/BOS (CICyT, FEDER,) ARAID and Globimed. The authors declare that we have no conflict of interest.